The Mobile World Congress has begun, and just before the official announcement, it seems that we have our hands on what is said to be the picture of Nokia’s next budgeted Lumia handset. 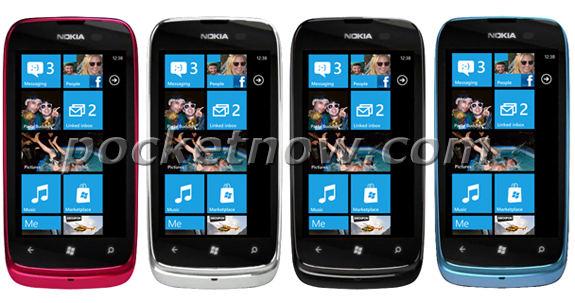 The image of the Lumia 610 has been leaked and it pretty much seems to be the real deal. The handset will come in the usual three Lumia colours, i.e. blue, pink, black, but also in the new white colour. Some specs of the smartphone have also been leaked. The Lumia 610 is said to have a 3.2 inch display, a 3MP camera, 256MB of RAM and will have the new Windows Phone Tango platform. Yes, it will be the first low end smartphone that will run Windows Phone with the Tango update, as earlier rumours suggested that the new update will be optimised for more discrete smartphone hardware. Also it is rumoured that it will be available at around Rs.11,000. Well, let’s wait for Nokia to unveil the device. We just can’t wait for it.